Apple’s consumer electronic items are by far some of the best computer hardware available in the industry. We covered all the Black Friday deals that were offered by Apple on various popular products like iMac, Macbooks, iPod touch, iPhone accessories etc. Now that Black Friday is over, Apple is now offering discounts on almost all iPhone, iPad & Mac accessories available from their online store. These discount offers though aren’t as exciting, with most of the items offered at 10% off than their regular prices. Some of these include: Michael Kors iPad Case for $116.95 instead of $129.95, a G-Technology Mobile Hard Drive for $89.95 instead of $99.95, Panasonic HM-TA1 HD Video Camera for $152.95 instead of $169.95 and many more. 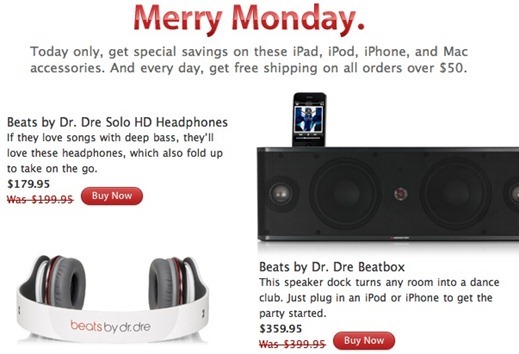 You can learn more about these offers at the online Apple Store site here.